Flatbread is thin and, in many instances, made without yeast. Many cultures have their own version and it was probably one of the earliest bread products ever made. Some of the oldest examples of food found in tombs and archaeological sites have been flatbreads. They vary widely in size, shape, texture and ingredients. Unleavened flatbread has a special symbolic role for several religions, especially Judaism. Matzo is a common example and it traditionally takes the form of a rectangular crisp cracker. Tortillas are a softer version, made with corn or flour, depending on the region and the dish. The disparity between these two dishes helps to illustrate the wide range of flatbreads eaten around the world. Some other examples include chapati, injera, pizza, pita, lavash, puri, barbari, arepas, and naan. Many of these breads are designed to work like eating utensils for scooping up foods from a common serving platter. They can also be wrapped or rolled around foods, stuffed like sandwiches or eaten plain. Almost every culture with access to grain has devised some kind of bread that is flat, made from ingredients, like wheat, teff, corn, rye or rice. The most basic flatbread is made from ground grain and water. Many cooks also add salt and oil for additional flavoring. Leavened breads may be made with yeast and they may also include eggs in some types. The variants certainly do not stop with the basic recipe, however, and the dough can be mixed with herbs, spices and vegetables, such as dill, thyme, cumin, coriander seed, onions, or garlic. In the case of pizza and focaccia, the bread may be topped with a wide variety of ingredients. Piadina is a thin Italian flatbread, typically prepared in the Romagna region (present-day Emilia-Romagna.). It is usually made with white flour, lard or olive oil, salt and water. The dough was traditionally cooked on a terracotta dish (called teggia), although nowadays flat pans or electric griddles are commonly used. 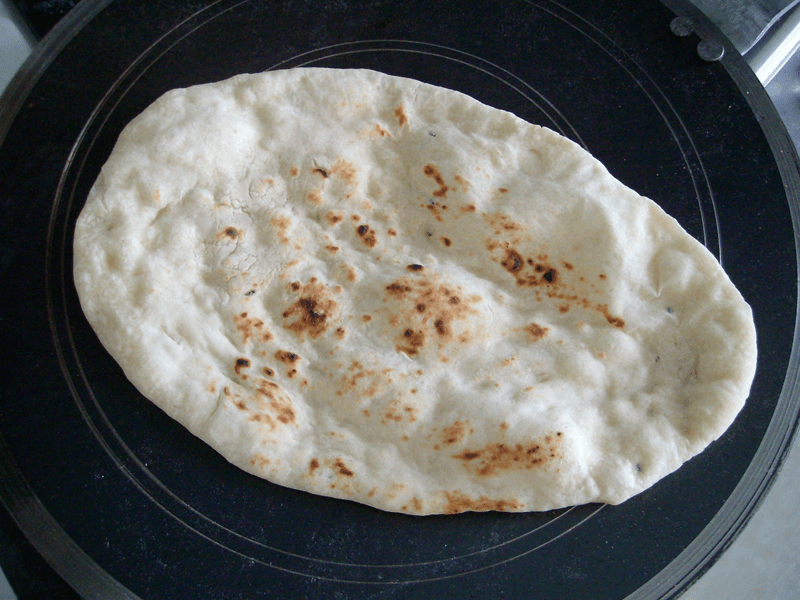 Piadine are usually sold immediately after preparation in specialized kiosks. They can be filled with a variety of cheeses, cold cuts and vegetables and sometimes with sweet fillings, such as jam or Nutella. There may be minor differences in the fillings, depending on the area of production. Piadine produced around Ravenna are generally thicker, while those produced around Rimini and the Marche region are thinner but the diameter is greater. Flat breads can be stored in several ways: Room temperature: 5 days; Refrigerated: 25 days; Frozen: 6 months – Quality is not compromised when frozen. Thaw at room temperature. These flatbreads are great for stuffing or rolling around a variety of ingredients, especially cheese and roasted red peppers. Place the flour, baking powder, Italian seasoning and salt in a large mixing bowl and stir to combine. Add the oil and ice water and mix to make a soft, cohesive dough. Adjust with additional flour or water as needed. The dough should be moist but not sticky. Cover with plastic wrap and let rest for 10 minutes. Preheat a heavy-bottomed skillet on the stovetop. Add 1 tablespoon oil and heat until the oil starts to shimmer in the pan. Divide the dough into 10 to 12 equal pieces. Each piece should weigh about 1 1/2 to 2 ounces, about the size of a large egg. Dredge each piece in flour and roll to a rough circle or oval, about 1/4″ thick or hand shape the pieces by flattening between your palms. In batches, fry the flatbreads in the hot oil for 2 to 3 minutes, or until golden brown. Turn and fry on the second side for another 2 minutes. Or you can put a griddle pan on high heat and cook each flatbread for a couple of minutes per side, until slightly puffy and lightly charred – you’ll need to do this in batches. Transfer from the pan to a rack to cool slightly before serving. Add more oil as needed for frying successive batches. Yield: 10 to 12 flatbreads. Combine the ingredients in the order given, one at a time, stirring well between each addition. Knead a bit by hand for the final mix. Work fast to keep the dough tender. The dough should be soft but easily rolled out. You may need to add a bit of flour or water depending on the weather and the type of flour you are using. Cut into 10-12 pieces. Roll out thin on an oiled surface. Create disks approximately 8 -10″ round. Prick the top of the bread with a fork and fry in a lightly oiled skillet or on a grill. These work well on the outdoor grill, if the the grill is well oiled. Good toppings are prosciutto and cheese. Place the flour in a large mixing bowl. Add the water gradually as you whisk the flour to keep any lumps from forming. Once all the water has been added, mix until completely smooth. Add the salt and pepper. Let the mixture stand on the counter for 3 hours or so. When ready to bake, heat the oven to 350 degrees F. Gently skim off any froth that forms on the surface of the mixture with a slotted spoon. Prepare a large rimmed cookie sheet by pouring enough olive oil onto the bottom to completely cover the pan. Once the oven is hot, pour the batter onto the baking pan, making a layer about (1/4) inch deep. Carefully place the pan in the oven and bake for 30 minutes, until golden. Remove the pan from the oven and let cool before cutting and serving. Pesto makes a great topping for this bread. Serve this flatbread as an appetizer or for lunch or dinner with a salad and soup. Use any type of herb that you like. Grill the onion slices until grill marks form on one side, about 7 to 8 minutes. Turn the slices and continue to grill until tender, about 7 to 8 minutes more. Stack the onions on a large piece of foil, wrap the onions up and let them sit for 10 minutes to soften further. Generously coat a 9×13-inch rimmed baking sheet with olive oil. Oil your hands as well, then evenly press the pizza dough onto the sheet pan all the way to the corners. Using your knuckles, make dimpled depressions in the top of the dough. In a small bowl, mix 2 tablespoons of the oil with 1 teaspoon salt and 1 teaspoon water; brush the dough with the mixture. In a medium bowl, toss the sage and onion with 1 tablespoon of the oil. Top the dough with the onion mixture. Bake in the center of the oven until the flatbread and onions are browned, 20 to 25 minutes. Season to taste with additional salt and pepper, if needed. Slice and serve. Sardinian flatbread is called Pane Carasau. This Italian flatbread has a crispy, cracker-like texture and is usually seasoned with rosemary and salt. It is also nicknamed “piano paper” or carta da musica which describes it’s thinness. It is said to have been first made by the shepherds in Sardinia, who took it with them into the pastures because it keeps well. Combine the two flours with 1 teaspoon of salt. In a small cup, dissolve the yeast and a 1/4 cup of the warm water. Let sit until bubbly. Add the yeast mixture to the flour with the rest of the water. Mix until you have a smooth dough. Cover and let sit 1 hour. Knead for 5 minutes and cover for another hour. Preheat the oven to 475 degrees F. Spray two flat baking sheets with oil spray. Knead the dough once more and divide into 8 equal balls. Roll each ball out as thinly as you canand place on the baking sheets. Bake each pan for 5 minutes in the preheated oven. The breads should blister but not brown. Remove from the oven and pile one on top of the other. Place a board or flat tray on top and let sit until cool. Return each bread to the oven for 10 minutes or until golden and crispy. Remove, brush lightly with olive oil, sprinkle with fresh chopped rosemary and salt and return to the oven for a few minutes. Serve warm. Thanks. Yes a quick, easy way to get fresh, delicious bread. It is so good and there are so many ways to serve it. Thanks Pam for visiting. I love flatbread Jovina! Just recently made some from scratch in a bread baking workshop I attended. Sprinkled with fresh herbs, cheese and a touch of sea salt–delish! Isn’t ir great that flatbreads are quick to make, yet taste so good. Thanks Karen. Seemingly so easy to make! I love flatbread and now I see it is quite do-able, no need to buy store-bought. Very nice recipes you featured too. Thank you so much. Give it a try – not hard to make and so much better than store bought.